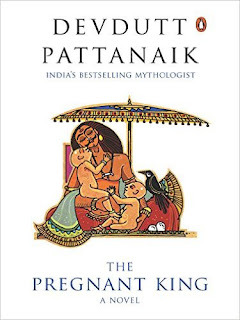 The Pregnant King by Devdutt Pattanaik is mythological fiction that takes funny, yet grim, stance on gender bias and duality. Gender bias and discrimination have always plagued the society wherever it existed. This story is based on the similar lines, well it is surprising to know that these issues even plagues during the Mahabharata era. The story has an interesting slew of characters and placed around Mahabharata time – so with characters and overall plot and setting, all make it a riveting read. Through the story we get introduced to a kingdom called Vallabhi. The king of this kingdom is Yuvanasha, but sadly he is childless despite having three wives, who at times teases him for his manhood. On the other hand, his mother Shilavati is a woman of staunch values and alludes herself as the ruler of kingdom. Not so far from this kingdom, the battle of Kurukshetra is on. Pandavas are busy fighting their kin Kauravas. Yuvanasha longs to fight for Pandavas but his requests are met with cold shrugs as first he has to sire an heir for the kingdom, chances are that he may not return alive from that battle. The king has already tried various methods and magic to pregnant his wives, but fails miserability. Note the polygamy here for the sake of an heir. To get the solution, some brilliant siddhis/sages prepare a child-endowing magic for the wives of king. Next, things go awry and instead of the wives, the king mistakenly drinks the potion and as a result he becomes pregnant without being copulated by someone. And after this point, the novel gets into its real skin and we all then see the preparations going for his delivery. Strange is that this concept crosses out the scientific theory of child birth, had this book been covered in today’s time. After that we see the changed feelings of the king. He goes groping for his identity...whether call himself father or mother. He longs to be called as a mother by his son but it is met with vehement opposition by his mother and wives. As you read this book, you will come across the society’s categorization of man and woman’s duty and so on. It is always tough for a man to be a mother or behave like that. A king epitomizes manhood and dharma; it is a tough journey for this king who craves to shower maternal love on his child. If you liked this cross concept, go ahead and read this book whose story and everything is set into mythological landscape.